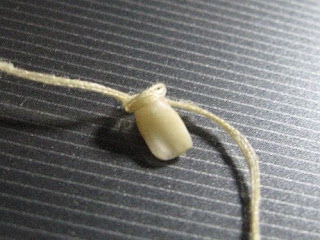 It's Crystal loose tooth. 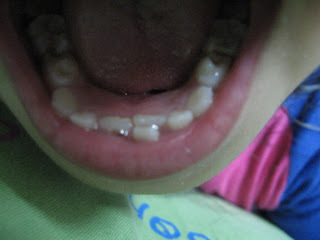 Her "baby incisors" have to give way to her "parmanent incisors" which have started coming out slowly 2 months ago. Luckily she only complaint once or twice about her gum sore, I thought it was due to heatiness and I gave her some cooling chinese tea for soothing regularly. She did not even aware of herself having new teeth or else she would have told us about it. I was the one who noticed them and very excited about it. I can still remember vividly when she had her first two "baby incisors" about 6 months old. They came unnoticed as well. There is still one more incisor needed to be pulled out soon. It is still pretty much attached to the gum. It's the daddy's task again. The one above was pulled out by the daddy with a thread; bleeding a little and she handled herself well. She is very excited about her new grown teeth too and do not mind showing them if you ask her to.